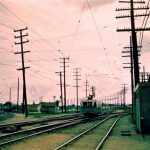 This tranquil 1956 photo at 6th & Main Street Station, once the hub of Pacific Electric’s comprehensive Northern and Southern District rail operations, belies the dire conditions of the Southern District and at this point, it was getting worse by the month. Car no. 5124 prepares to depart on one of the last late-night runs along the 7-mile route to Watts. Anti-rail, pro-bus Metropolitan Coach Lines management had managed to destroy the Western District rail operations in less than two years after purchasing PE’s passenger service. The wonderful Subway Terminal tunnel was now a tomb for the worlds most beautiful PCCs , left unguarded to rot and endure horrible damage by sick vandals. The four Southern District lines were now operating under the most deplorable conditions. The elevated terminal was now a rail island in a sea of green MCL buses. About 45 Blimps and 15 Hollywood cars were now on an RFT (run till failure) status. Except for replacement of broken windows, all cosmetic maintenance on the cars ceased the day Metro Coach Lines took over the rail operations. Only minor mechanical repairs on the cars were made under primitive , open-air conditions at Fairbanks Yard, using “arm strong” tools. The loyal passengers of the Southern District (myself included ) endured filthy and unkempt cars. All the while, MCL management continued to request the complete abandonment of the rail system to the PUC, to no avail. That dirty deed was left to the LAMTA. The Southern District rail line did not stand a chance for survival, as the new LAMTA did not have to answer to the PUC or anyone else for that matter. 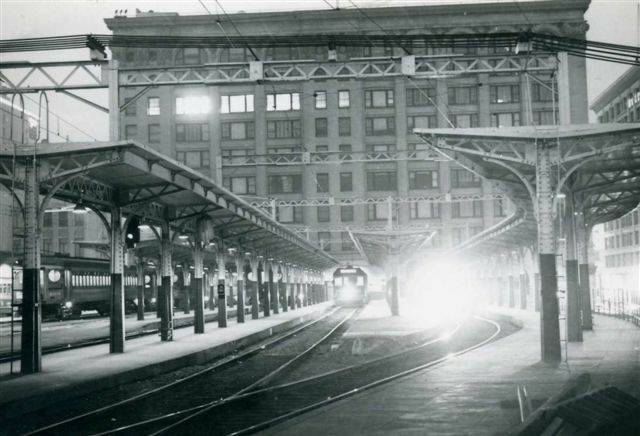 The Southern District along with the 6th & Main Street Station were now doomed. 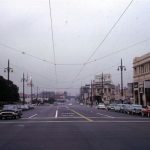 By the time the Watts line was abandoned, only one extra car was available to meet basic rush hour service requirements. Four unserviceable Hollywood cars, stripped of usable parts, sat in the weeds at Fairbanks yard. Finally in April of 1961, only about 30 or so operable Blimps, now in disgraceful condition, were still serviceable. Only one car (1543) received a new coat of paint, the first new paint since the big car left Torrance Shops back in 1947. The rest of the Blimps died with their RED PE boots on. Maybe somebody else will remember this. I have a vague memory of one of the P-3s having one axle set of the older resilient wheels ( big hex nut) like the 3001-3125 had. There is no reason that this could not have been done. I have gotten interested in this because of researching new wheels for the 3165 at OERM. I am hoping somebody out there has a picture of this. Many thanks.